Helmed by a man identifying himself as Don “Moose” Lewis, the president of the International Wrestling Union (IWU), Lewis has also had some involvement in boxing, he has claimed, in interviews with Georgia papers, that his rationale isn’t racism, but opportunity. This, and the crudely-written press release, would be laughable if Mr. Lewis was just kidding. “When I heard about the AABA, I couldn’t believe that it was serious. They are serious. And they should be ashamed of themselves,”said Joe Newman, CEO of the ABA. What Moose proposes is to take the sport of basketball backward to the separate-but-equal days of baseball’s shameful segregationist past, a place which the sport of basketballl thankfully missed. To get there, not only does he have to find backers, but he has to find white players who either dye-in-the-wool racists OR who have to admit to the world, by their taking the court for the AABA, that they are not good enough to play in a league open to people of all races and creeds. Players who play in such a league might find it hard to play elsewhere. “I cannot imagine any basketball player with character being a part of this league, and we would certainly question their ever playing in the ABA.” said Newman. Assuming that Mr. Lewis can tear enough people away from their 8mm movie festivals of Leni Riefenstahl movies glorifying Nazi Germany and TV reruns of “Birth of a Nation” to fund this league, he would still run head-long into the brand-name infringement with the American Basketball Association. His clubs would be fighting for turf in some markets with the ABA and the IBL. The ABA is having its lawyers look into whether the AABA name will infringe on their brand. 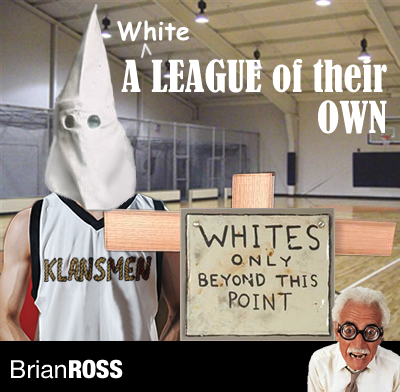 Sadly, if Moose can put together the money to launch whites-only basketball, the concept may well find traction in the South. I have seen a lot of minor leagues come and go over the last 11 years. What I can tell you is that leagues that survive find a niche, a hook if you will. Racism is a big hook. Right now, in the “Oh my God we have a black president for REAL” backlash from last year’s election, we have seen the submerged currents of racism running through our society leak out in everything from the Tea-Bagger movement to Sarah Palin’s white-fright love-fests. People who want “their country back” may also pay to see “their game” come back to them as well. “Would you want to go to the game and worry about a player flipping you off or attacking you in the stands or grabbing their crotch?” he told the Chronicle. I guess that Moose missed tennis star John McEnroe’s salad days. The answer of cleaning up conduct-league wide in a racially-blind manner apparently is not good enough for this wrestling entrepreneur. Having a white-only league is his white God-given right. I have to agree. We’re free to move ourselves in a better direction. Personally I will be moving away from Moose and the blatant racism for which he stands. I’m for one nation, indivisible. Which will keep MLN Sports away from covering a league that knowingly espouses segregation. This entry was posted on January 12, 2010 by Brian Ross in 2010, Basketball, Ideologies, Racism, Sports, Tea Party and tagged AABA, Aba, Basketball, Minor League Basketball, Nba, Politics News, Race, Racial Discrimination, Racial Identity, Racial Prejudice, Racism, Segregation, Sports News, Tea Party, Tea-Baggers.